Paper Daisy Crafting: Easter Mini egg treat box with Sweet Soiree from Stampin' Up! 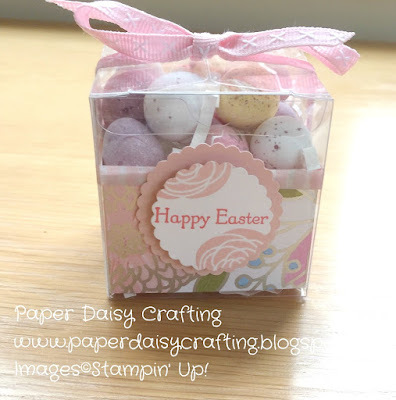 Easter Mini egg treat box with Sweet Soiree from Stampin' Up! I hope you are having/have had a lovely Easter! I must confess I'm a bit late with this project - I've been meaning to share it with you for over a week but somehow just never had time. So here it is - a bit late for Easter, but as I say on the video, it could easily be adapted for other occasions or uses - wedding favours, jewellery gift box etc. This is a very simple little project, made even simpler by using our Clear Tiny Treat Boxes. I've made a video tutorial so you can see how to make one (or more) of these yourself. View it HERE or click on the image below.